God loves us, and in turn, God yearns to be loved. Love is the main reason Jesus comes to the earth and love is at the center of today’s text—although at first glance—it may not appear so. Jesus has been teaching his disciples and others gathered around. He has been warning folks about the danger of hypocrisy, about the dangers of storing up treasures on earth rather than treasures in heaven, and about the need to be watchful for surely the hour of judgment is nigh. In the midst of Jesus’ teaching, certain they know what his message is all about, some in the crowd bring up recent news of murder in the temple. The implication is that “they” must have sinned. It’s an age-old assumption: When bad things happen to people, it’s because they have done something wrong and so they are just getting what they deserve. It was a common notion among the people of Israel. In too many circles, it is still a common notion. This passage from Luke, found nowhere else in the gospels, demonstrates that while Jesus is compassionate, he is not indecisive. [ii] He demands that sinners repent before it is too late. While God is a God of love and mercy and grace, only a cotton candy gospel promises us that God meets us where we are and is happy to leave us there—wherever “there” may be! Jesus wants his followers to understand the harsh reality that anything can happen to anyone at any time. It’s not necessarily because “those people” are being singled out, it’s because that is the nature of the broken world in which we live. Tragedy comes, sometimes by the hand of an angry assailant, sometimes through natural disaster… That being said, it is best to get things right with God and others now—not tomorrow—but now. as to withdraw them from all that is under heaven. One scholar offers a helpful word of warning as we try to interpret the parable rightly. [v] While the owner of the land and the gardener in the parable represent God and Jesus, we push the parable too far if we slip into the error of thinking this means God is hard-hearted and bent on the tree’s destruction, while Jesus is the kind-hearted one, bent on saving the tree. Such an understanding is nothing short of bad theology. Instead, what we have before us is a divine paradox—God is pleading with God to be patient with these stubborn, wayward humans. Does this seem ridiculous? Well, don’t you sometimes talk to yourself, especially when you are trying to work out something difficult? I talk to myself when I do something as simple as try out a new recipe. Or you might be like the person in the Facebook meme who proclaims, “Sometimes I talk to myself because I need some good advice.” Sure, most of us talk to ourselves from time to time. So why shouldn’t God the Father and God the Son be in dialogue with one another? Isn’t that what the Trinity is all about? A truer understanding of God and Jesus in this parable might be: The compassion of Jesus is God’s compassion. The love, patience, and hope of the gardener is the love, patience, and hope of the owner. And that’s the comfort the parable brings. But there is a word of warning, too. Opportunity may knock, but it will not always be so. If the tree does not respond to the care, the digging, the fertilizer, then there will come a time when it must be cut down. God’s grace pours down upon us like rain, but if we do not accept the gift, we, too, will be barren. And if we bear no fruit, what good are we to the land-owner? What good are we to the kin-dom of God? Jesus looks out over the people and sees the fruitless lives many are leading. They are not fruit-bearers; instead they are barren down to their roots. While some will accept him with open hearts and minds, others will follow him in secret; and still others will out and out reject him. Nevertheless, Jesus the Bread of Life, looks with compassion on them for he knows what they are missing out on—the good news of whole, transformed, abundantly fruitful lives. Here we are this morning, still on our Lenten journey. It’s the perfect time to examine the health of our hearts and minds and souls. How are we doing? How are we responding to God’s grace and love? Have we turned from sin? Are we bearing fruit? By the way we choose to live, can people tell we are followers of Jesus Christ? Do we exhibit the fruit of the Spirit: love, joy, peace, patience, kindness, generosity, faithfulness, gentleness, and self-control? If not, what areas most need tending? 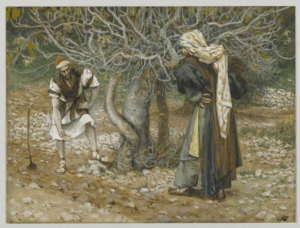 In the parable of the fig tree, Jesus doesn’t tell us the end of the story—only, “One more year, and we’ll see…” God wants to give us more time so God will hoe and throw fertilizer and do the hard work, but we will have to do our part. A day of reckoning is inevitable. One day we will each breathe our last—from dust we came—to dust we shall return. It is prudent and wise to get things right with God and with others—and sooner is much better than later. In the name of the Father, and the Son, and the Holy Spirit. Amen. [ii] The New Jerome Bible Commentary, 705. [iii] Fred Craddock, Luke: Interpretation Series, 169.